The night sky at any time! 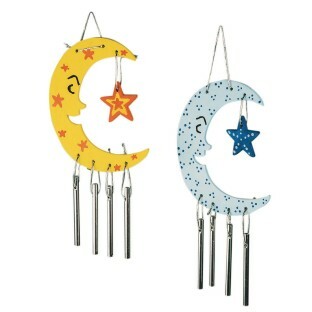 Easy-to-assemble wood moon/stars, metal chimes and silver cord. Approx. 4"W x 9"H.
The Kids jsut love these! This is an activity we do in the summer and the kids just love it! Neat item idea but be prepared to provide your own string for hanging chimes star the wind chimes as a unit. What is provided shreds badly and the string is way to short. I couldn't even get my fingers around it to tie it when trying to use the recommend amount. The children enjoyed painting the wooden moon but they had to wait for the adults to scramble to tie each chime and hanging loop. used these for VBS. The kids used markers to color them. For the younger Kids I pre-assembled. The older kids did their own assembly.